With several key destinations available for picking up a Sixt car rental in Mannheim you can seamlessly map out your German adventure. We offer a choice of several branches where you can rent a car in Mannheim. Find our services at convenient locations such as Mannheim Airport and Mannheim Central Train Station. The majority of our car rental in Mannheim locations offer a 24-hour return policy, which allows you maximum flexibility during your travels in Germany. You can find more information about our services and rental cars available as you scroll through the page. No matter your mobility needs, we are ready to meet them with our diverse, top quality fleet of cars and trucks! Available at our Mannheim branches is a wide selection of vehicles available for all traveling purposes. Whether wanting a luxury car rental from leading brands such as Mercedes-Benz and BMW, or are looking for a more budget-friendly rental vehicle, we can accommodate. Find out exactly where our Mannheim rental locations are by clicking on the second tab of the menu to display an overview of our branches on Google maps. You can also scroll through our drop down menu to see about useful information such as the opening times, addresses and vehicles on offer at each branch. Once you have chosen your pick up location head to our booking page to reserve your car online. Please note we can only guarantee you to receive a vehicle in your chosen car category as specific models are subject to availability at each of our Sixt rent a car Mannheim branches. No matter your mobility needs our extensive fleet can cater to your budget and plans. For weekend getaways make a price comparison and see how you could try out a sleek Maserati or other sports car for less than you think. We also provide a range of rental cars that are perfect for business trips, family vacations and group outings. Our choice of diverse compact city cars, comfortable sedans and minivans to large passenger vehicles and SUVs make it easy to find a model to match your trip. Once you choose your rent a car, book ahead online or over the phone. While you make your reservation you can select from our useful extras to enhance and customize your car rental experience. We offer various add-ons at great prices to help you have an optimal ride like additional driver coverage or a GPS. If flying into Mannheim you will land at the regional airport, which is very close to the city center. Picking up your car at our Mannheim Airport location means you will be downtown in about ten minutes. Parking your rental vehicle whether in the city center, or elsewhere, should be rather easy. Make use of the numerous parking lots and garages which allow maximum flexibility with round the clock operating hours. Those who are arriving at the Mannheim Central Station can find our branch on the ground floor. 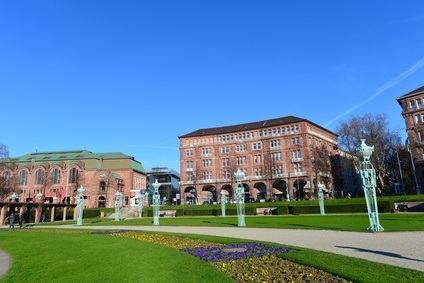 If you want to start sightseeing right away you can conveniently leave your car at the station and hit up top attractions like the Mannheimer Schloss which is now part of the university. Our Mannheim Neckarau car rental branch is located in the southern part of the city about a fifteen minute's drive from the city center. You can find out detailed directions from the branch page. Because of its manageable size and central location driving around Mannheim is relatively stress-free. Located in Southwestern Germany in the region of Baden-Württemberg, you can easily access many of the top German cities from Mannheim such as Frankfurt, Stuttgart, and Nuremberg. Germany is known for their high-quality motorways and also for taking safety seriously, so don't forget to buckle up! Mannheim's city center, set in the Quadratestadt, is laid out like a grid and has no official street names. Rather, blocks have names like Q3 and Q2. Originally built to surround the city's fortress in 1606, the city is located directly along the Rhine and Neckar rivers. Once famous for its beauty and industrial significance, Mannheim was unfortunately largely decimated during World War II. As a result, Mannheim today is now a mix of old and new. 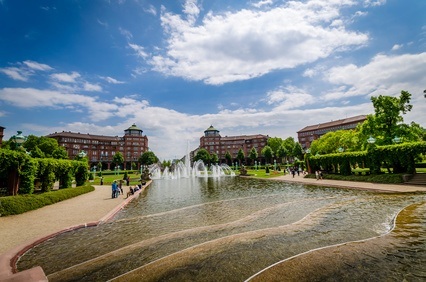 For those who are interested in architecture, Mannheim, like many German cities, is a mixture of industrial landscapes and historical charms that tells the history of both past and present. Upon arriving in Mannheim, there is plenty to do as soon as you pick up your vehicle. The centrally located Luisenpark is a great place for a stroll or a scenic gondola ride. The fully landscaped park is lined with sculptures from various artists and includes an exquisite butterfly house. In addition to Mannheim's natural attractions, a visit to the Mannheim Schloss, a Baroque palace is also recommended. Constructed in 1720, the structure runs an impressive 450 meters along the central area all the way to the city's main square, Paradeplatz. Not far from Mannheim is Speyer, one the one of the oldest German cities, and is home to a charming Old Town. Besides strolling around you can visit the Historisches Museum der Pfalz, the Technical Museum, IMAX Dome cinema or the Sealife aquarium. Also worth the trip from Mannheim is driving to see the Heidelberg Castle. Visitors from all over the world come to marvel at the beautiful castle ruins which are some of the most important of its kind. Set in a striking location you can enjoy a day walking around the grounds and gardens of this magnificent, historical gem. When on business, rent a car in Mannheim and have an affordable and convenient way to get around. You can arrive on time and relaxed to important meetings or to functions and be able to set your own schedule. The city is home to several large offices and factories from companies such as Bombardier, Siemens, and John Deer. As it is in close proximity to Frankfurt those who come to do business in Mannheim often attend major industry Congress Center Messe Frankfurt as well. Below are the quick answers to some of our most frequently asked questions. Please be reminded that every country has slightly different rules and regulations, so for the most specific and detailed information pertaining to your desired rental please visit rental information for more information. Paying with a major credit card is the preferred method of payment and Sixt accepts all major credit cards. The payment method must have been issued in the name of the driver and this must be presented at the time of vehicle pick-up and be valid at this time. Check our Rental Information page for country specific information. Which documents are needed to pick up a rental car? A valid driver's license for all named drivers, valid for a minimum of 12 months. Driver's licenses printed in non-Roman alphabet (Arabic, Chinese, Cyrillic, etc.) must be accompanied by an International Driving Permit. Any driver's license originating from countries not part of the international driver's license treaty must also be accompanied by an official translation. A valid ID card or passport might also be required at time of pick up, please refer to our Rental Information page to see the exact requirements for the country your rental will take place in. What is included in the rental charges? Cancellations and changes can be made at any point prior to the start of the rental, but may in some cases incur additional charges. Prepaid reservations are subject to cancellation fees as well as other specific restrictions regarding amendments and refunds. Check our Rental Information page for country specific information. Territorial restrictions apply depending on the country the rental takes place and where the vehicle will be driven to. For specific information please contact a Sixt booking agent or refer to our Rental Information page where you can find county specific information from our drop down menu. What is Sixt's refueling policy? All vehicles are supplied with a full tank of fuel and should be refilled prior to return to Sixt, otherwise our current refueling charges will apply. Alternatively, you may purchase a tankful of fuel at the time of rental at a price that is competitive with local fuel stations and return the tank empty. No refunds will be given for unused fuel. What add-ons are available and how much do they cost? Sixt offers optional add-ons such as child seats, guaranteed navigations systems, additional drivers, winter tires, snow chains and luggage racks. Including extras will incur additional fees and are subject to availability at Sixt rent a car locations. Can I rent a car with unlimited mileage? Sixt rent a car offers unlimited mileage on select vehicles at select Sixt locations. Does Sixt deliver and/or collect rental cars? Deliveries and collections are available at select Sixt rent a car locations and are subject to additional fees.